tasty cookie gamecollect delicious cookie free match 3 gameClassiccookie match 3 game in 2016, switch, smash, splash, match and crush3 or more cookie to blast them all, to be a cookie matchlegend.Free to play, most exciting cookie explosion mania gameawaits you!cookie game is a brand new cookie match game, with freefunny match 3 puzzle adventure and addictive cookie splash maniagameplay.sweet cookie world is built for three match game lovers tostart a cookie exploration adventure to save king from cookiekingdom.Tap to drag, switch, match, splash cookies in your stylethrough 300 levels in this delicious coookie legend kingdom. Thequest of cookie cake mania starts from wonderful cake guardian.Select and link more and more cookie guardians to blast evil cookiefarm defense, to enter another blossom paradise, to save yoursweety cookie land.cookie game mania features sweet jelly cookietaste style HD graphics, stunning cookie exploration adventure,hero making story line, legend cookie hero makes your adventureworthwhile.cookie game features:- More than two hundred levels tochallenge.- Plan for moves, match & blast to complete tastycookie missions within certain movers.- Free & addictive matchthree casual puzzle game.- Crush as many cookies and cakes as youcan within certain moves.- Take over cookie adventure, save beautycookie queen, to be the match 3 hero.- Plan, tap & drag,switch, match three or more in a row to blast tasty jelly cookies.-Special visual feast: match 5 cookies to trigger successiveexplosion.- 5 different lands in this cookie world to explore.- Usewisdom to crush as many cookies as you can.Hundreds of cookielevels to blast, free cookie game in 2016!Drag, switch, smash andmatch identical cookies to eliminate them, convert them into starenergy collected in the bottle.Travel and crush in this tastycookie world, collect & taste jelly cake and juicy cookie withsweet cookie boost! cookie game 2! Fun match-3 puzzle game in 2016!classic cookie gamemania free match 3 game for cookie lovers to crush!Addictive cookiematch-3 game in 2016, switch, smash, splash, match and crush 3 ormore candy cookie to blast them all, to be a cookie matchlegend.Free to play, most exciting match cookie game awaitsyou!cookie game 2 is a brand new cookie match game, with free funnymatch 3 puzzle adventure and addictive cookie splash fevergameplay.cookie exploration game world is built for three matchgame lovers to start a cookie candy exploration adventure to saveKing from cookie kingdom.Tap to drag, switch, match, splash candies& cookies in your style through 200 levels in this sweet candylegend kingdom. The quest of cookie farm mania starts from harvestcandy guardian for cookies. Select and link more and more cookieguardians to blast evil candy farm defense, to enter another farmblossom paradise, to save your sweety candy kingdom.cookie game 2features sweet candy cookie style HD graphics, stunning candyadventure, hero making story line, legend candy game makes yourcandy adventure worthwhile.cookie splash candy game features:- Morethan two hundred levels to challenge.- Plan for moves, match &blast to complete sweet blossom candy missions within certainmovers.- Free & addictive match three casual puzzle game.-Crush as many cookies and candies as you can within certain moves.-Take over cookie adventure, save the candy king, to be the match 3hero.- Plan, tap & drag, switch, match three or more in a rowto blast delicious cookies.- Special candy visual feast: match 5cookies to trigger successive cookie explosion.- 5 different landsin this Candy Kingdom to explore.- Use wisdom to crush as manycookies as you can.Hundreds of cookie levels to blast, free cookiegame 2 in 2016!Drag, switch, smash and match identical cookies toeliminate them, convert them into star energy collected in thebottle.Travel and crush in this cookie world, enjoy cookie gamewith sweet cookie boost! Royal Monster Paradise Match, the most fun monster match 3 puzzlegame.Other than horrible monsters, cute monster fellows in RoyalMonster Paradise Mania will attract your focus on saving them. Saidthat one could save all these royal monster fellows will be crownedas King of Monster Land. Slide, swipe, link, and reshapecombination of monster order, blast once them all to unleash flashlight effect, to release your royal fellows. ROYAL MONSTER PARADISEis made for three match game lovers to start a rescue journey tosave people on Monster Planet. Switch and match your way throughhundreds of levels in this match three puzzle adventure.Connect 3or above monsters in a row to release them, match 2 special booststo blast enemy monsters to get key to save your brothers. Morecombos to get, higher scores to obtain. Believe it or not, you willlove this royal monster match 3 game with addictive match threecasual puzzle game experience, to complete an interesting matchthree monster fight adventure.More than two hundred of levels toexplore. Learn, practice and enpower yourself during monster savingjourney to become a everlasting King, and then marry a beautifulMonster Queen, to start a wonderful and sweet family forever. Nofight, no happiness! Try it Royal Monster Legend Mania! you'll finda lot of fun. Wish you will be happy playing Royal MonsterParadise. minesweeper master free gameMinesweeper: explore mine fields, clearall mines if you can.Tap, calculate, sweep & flag all minetiles apart, to be minesweeper master. Minesweeper : Sweep MineTiles is a classic computer minesweeper game, now free for androidnow. The rule for minesweeper is simple : don’t tap any mine tile ,or you will lose .How to play minesweeper : sweep mine tiles ?- Tapone tile to uncover what hides behind- Calculate the amount of minetiles around after got the number- Use your widsom & mine sweepstrategy to determine which one is mine tile- Long press the tileto flag it as a mine tile- In case of hard to make minesweeperdecision, try from other tilesMinesweeper : sweep mine tilesfeatures:- 4 different modes : Easy, Normal, Hard, Hell- Clean& simple UI design- Dozens of levels to challenge- Auto save :you can pause the game and continue later- Flag any tile as youwant- Mine mode and flag mode are more challeneableMinesweeper :Sweep Mine Tiles is an offline video game. Your goal is to flag& clear all mines in a virtual minefield without detonating amine tile.Never tap the mine tile, how long can you last duringyour minesweeper journey? Flap Bird free puzzle game.Flying Bird Flap Free Adventure.Tap toflap various birds to fly through infinite pipe world. Simpleoperation, just one or two taps to flappy the angle, move wings,fly away the pipe world. Help flying birds to flap through thisevil pipe lands.Fly Bird Flap Free is easy to play, but hard tomaster. Try to help poor bird get back to Miami Home.Flap wings ofa bird, slowly and steady to avoid flappy pipes and obstacles.Never get dropped on the ground or touch any pipe, or you willdie.Every time cross the gap between pipes, you must fly throughcarefully. Fly as a real bird does.Flying Bird is a very challengeadventure game! With classic flappy gameplay. Flying Bird is angryto start journey to find missing bird babies. With you help, itwill flap little wings and fly across winds and various lands totake missing flying bird babies back.Fly Bird Flap Free Features:-Classic Flying Bird gameplay.- Tap, fly, hold, keep steady to crosspipe Kingdom.- Free and small, enjoy bird flying adventure!FlyingBird taking classic bird flying game play, totally free forall.Tap, fly, hold, keep steady to cross various pipe forest.Enjoythis flying bird adventure! farm cookie candy gameHarvest Mania Farm Paradise!Farm ParadiseMania Match 3 game!Classic farm match 3 game in 2016, switch,smash, splash, match and crush 3 or more farm vegetables to blastthem all, to be a super farmer legend.Free to play, most excitingharvest mania farm paradise game awaits you!Farm Candy Mania is abrand new farm candy match game, with free funny match 3 puzzleadventure and addictive farm harvest splash mania gameplay.Blossomfarm Mania world is built for three match game lovers to start ablossom candy exploration adventure to save King from farm blossomKingdom.Tap to drag, switch, match, splash candies & blossom inyour style through 200 levels in this sweet blossom candy LegendKingdom. The quest of candy farm mania starts from harvest candyguardian. Select and link more and more candy flower guardians toblast evil candy farm defense, to enter another farm blossomparadise, to save your sweety Candy Kingdom.Farm Candy ParadiseMania features sweet fruit candy style HD graphics, stunning candyadventure, hero making story line, Legend Candy Mania makes yourcandy adventure worthwhile.Farm Blossom Candy Mania features:- Morethan two hundred levels to challenge.- Plan for moves, match &blast to complete sweet blossom candy missions within certainmovers.- Free & addictive match three casual puzzle game.- Takeover candy adventure, save the Candy King, to be the match 3 hero.-Plan, tap & drag, switch, match three or more in a row to blastharvest vegetables.- Special candy visual feast: match 5 candy farmfruit to trigger successive fruit candy explosion.- 5 differentlands in this Candy Kingdom to explore.- Use wisdom to crush asmany candies as you can.Hundreds of candy levels to blast, freecandy mania 2016!Drag, switch, smash and match identical candies toeliminate them, convert them into star energy collected in thebottle.Travel and crush in this candy world, enjoy Harvest ManiaFarm Paradise with sweet blossom candy boost! Candy Smash ManiaSplash, smash, switch to match 3 or more candy toblast candy mania.Candy Mania is a brand new candy match game, withfree funny match 3 puzzle adventure and addictive candy splashmania gameplay.Candy Mania world is built for three match gamelovers to start a candy exploration adventure to save King fromCandy Kingdom.Tap to drag, switch, match, splash candies in yourstyle through 200 levels in this sweet candy Legend Kingdom. Thequest of candy mania starts from candy guardian. Select and linkmore and more candy guardians to blast evil candy defense, to enteranother candy paradise, to save your sweety Candy Kingdom.CandyParadise Mania features sweet candy style HD graphics, stunningcandy adventure, hero making story line, Legend Candy Mania makesyour candy adventure worthwhile.Candy Mania features:- More thantwo hundred levels to challenge.- Plan for moves, match & blastto complete sweet candy missions within certain movers.- Free &addictive match three casual puzzle game.- Take over candyadventure, save the Candy King, to be the match 3 hero.- Plan, tap& drag, switch, match three or more in a row to blast candies.-Special candy visual feast: match 5 candy to trigger successivecandy explosion.- 5 different lands in this Candy Kingdom toexplore.- Use wisdom to crush as many candies as you can.Hundredsof candy levels to blast, free candy mania 2016!Drag, switch, smashand match identical candies to eliminate them, convert them intostar energy collected in the bottle.Travel and crush in this candyworld, enjoy Candy Mania with sweet candy boost! Jewels Goda GemsNever imagine Jewels can goda gems, right? ButJewels Goda Gems will fulfill your dream. This is a brand newadvanced match three jewels goda gems puzzle game.In Jewels GodaGems, hundreds of tricky levels and challenges to draw lucky gems.Collect certain number of jewels and gems, then can melt them intodiamonds as you wish in your way in your style. Featuring match 3game puzzle adventure experience, Jewels hardly appear, so once yousee them, take your chance at once to match 5 more gems around themto blast & collect them out. Designed in jewel and gem styleelements, use your skills and imagination to be a Master for JewelsGoda Gems game.Conquer more and more jewels as you can, slide andswipe to match 10 gems in the same color, can you make it. If youdone, a tramendous blast jewel effect leads you into a diamondworld. Combine many gems to create amazing combos with magicalexplosion. In this super Jewels Goda Gems casual game, you canenjoy its insanely addictively gameply, fantastic power ups.JewelsGoda Gems, a free and fun match 3 game. Wish you will have fun withit! Cookie blast is a Classic match3 game that can make you relaxed.and the wonderland is full with all kinds of cakes and cookies.Youcan produce sweet chocolate, and cream, sweet cookies can not onlymeet your appetite, but also bring you endless joy. Come ahead oftime!A new interface style designed by a creative master will giveyou a different experience!Have fun!HOW TO PLAY:• Swipe to match 3or more cookies• Collect the cake and cookie,complete the levels!•Enjoy story-line and various task!• Achieve 3 stars to get morecoinsCookie Blast FEATURES:-FREE• This is a free game and you canplay it all the time-EASY AND FUN PALY• You can easy to play ,justswap&crush&match-TONS OF CREATIVE LEVELS• Over 240 creativelevels, full of fun and amazing challenges!-NO WIFI IS NOT PROBLEM•you can play offline! Cookie Crush yummy coloring cake, newly Colour star cookie,deliciously jammy cookie blast game.Crush cookies, swap cakes, makesuper bigger matches, explore from around the world map.Swap andmatch candy, win awesome prizes and clear the board. Cookie Crushis an amazingly new style match 3 time killer game!Sprinkled with adeliciously sweety cake, fun and sweet challenges to your travelingon this new puzzle adventure.Match your way in 1000+ addictivesweet match 3 levels by making scrumptious cookie boosters.HOW TOPLAY IN COOKIE CRUSH:● Move sweets to make matches!● Match atleast 3 cookie candy sweets of the same type to burst● Make uniquecombinations to get special cookies and power-ups● Easy toplay but hard to get 3 cookie-stars in each levelHIGHLIGHTS OFCOOKIE FEVER:- Design for beautiful lady.- Delicious new challengesand game modes- Stunning graphic, Delightful music, Fantasticeffects.- Fantastic cookie wonderland, beautiful dreamworld.- 1000+well-design challenging levels.Download Cookie Crush, unlock funbonuses and win levels, experiencing deliciously jammy cookiesweets! 😋Wow! Plenty of delicious cakes! Join the sweetest match 3 puzzleadventures FREE now! 🍰 Explore in Cake Match 3 Mania world, 420+enjoyable levels are waiting for you! Match the same cakes, beatthe devil bakers and chef! Bring your friends together to breakrecords in this cake quest! You can play with these tempting cakeswithout WIFI anywhere and anytime.👬💪 HOW TO PLAY ★ Cake swap andmatch 3 or more sweet cakes of the same to crush! ★ Collect tastycake material: candy, cookie, chocolate, honey, jelly, ice lollyand so on! ★ Matching candy to beat devil bakers and chef! ★Challenge to win HUGE BONUS! CAKE MATCH 3 MANIA FEATURES ★ Over 420delicious levels, more added regularly! ★ Over 10 game modes likeno other! ★ Pass level 30 to unlock CHALLENGE levels! 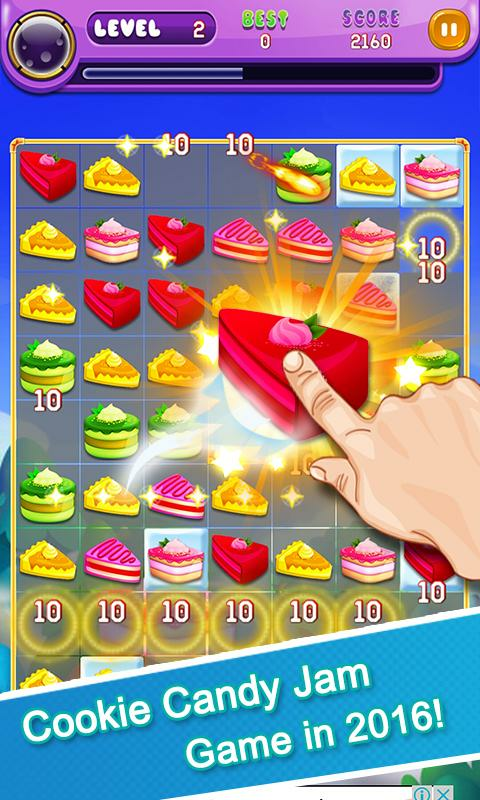 ★ To be aCake Maker MASTER, swap and match cake and candy to beat badbakers! ★ Tasty Cakes, wrapped and striped Special Candies, ColorBombs. ★ Various other magical boosters to help with completinglevels. ★ Collect daily bonus for a delicious prize! PLAY WITHFRIENDS ★ Connect to Facebook and play with friends! ★ See yourfriends on the map! ★ Synchronize the game on multiple devices andplatforms! EASY AND FUN PLAY ★ Easy to control, fun to play, greatgraphics! ★ Just swap & match with your single finger! NO TIMELIMIT ★ Play at your own pace! NO WIFI? NO PROBLEM! ★ Games you canplay offline. Cake Match 3 Mania is completely free to play butsome optional in-game items will require payment. You can turn offthe payment feature by disabling in-app purchases in your device’ssettings. Email: [email protected] Take a travel in thisfascinating cake gallery! Have fun playing Cake Match 3 Mania! Cookies Jam 2 is a classic match 3 puzzle and definitely brings youfun. Jam your cookies before they collapse in Cookies Crush,sprinkle a sweet, fun and challenging cake to your traveling on newpuzzle adventure and discover from around the world.Come and enjoydelicious cookies, delicious sugar and delicious jam in CookieSmash with Cookies Jam 2Bring this Match 3 game cookies crush jam 2to the road filled with Smash and Cookies fun to your phone now!FUNCTIONS COOKIES JAM 2● Unique and delicious cupcake and candyset with cookies crush jam and sugar in each level gives you tonsof sweet challenge.It's easy to get millions of sugar and rewardjams from daily events and wheels in Cookie Smash. That's a bighelp in hard junk! Remember to log in daily to get them!● Watch outfor cookies and sugar smash and how much you move away, please donot hide your props and try them to help you get higher pain! Comeon and play the best cookie and game lines.● classic cookie games,you can make thousands of not only sugar but also sweet andconfounding jammed here!● Learn the new pros, magical jam, toupgrade his power to defeat the monsters! And you will become theking of sweet candy!● Let's recreate the cupcake and cookiematching 3 sweep games around the world!● new mode game Cookiehiding in the map and they are waiting for you!● Let us experiencethe sweet cookie delights and sugar smash, whip your way to makedelicious cake smash!Welcome to the sweet fairytale world full ofcookies and sugar in Cookies Jam 2017 ! Let the manuscript for thecookie and sugar, sweep the cupcake all over the world !Thank youall for downloading Cookies Crush Mania. Please do not forget tolet us know what you think about the game! Here comes the Cooking Jam - Match 3 Games for Cookie is anaddictive & fun puzzle colorful game but more colorful effectsthan ever to exercise your Cookie Crush skills.Jam your cookiesbefore they collapse in Cookie Crush, sprinkle a sweet, fun andchallenging cake to your traveling on new puzzle adventure anddiscover from around the world.This cookie crush jam has welldesigned puzzles for you to play in anytime and anywhere! Be theCookie Crush and unlock all castles in this Cookies Jam game. Enjoythe best combination of game. Is available in 15 languages with10.000 levels per language, so even the smartest Cookies Jam gameenthusiasts will have a real challenge to complete this gameBringthis Match 3 game cookie crush jam 2 to the road filled with Smashand Cookies fun to your phone now !HOW TO PLAY:• Make Match 3cookie games or swipe Cookie Crush game in a line to crush andremove them• Make the Jam your cookies down to the last line topass the next level• Arcade Mode: Reach a specific goal to solvethe puzzle saga• Time Mode: Match as fast as you can to level up inCookies Jam• Reach different level target to pass levels in youradventureSCORE TIPS:• We recommend you scramble with friends tohelp pass cookie crush jam this easy• Our biggest update to the jamin Cookie Smash ever includes 100,000 new style, inspired by ourplayers sugar and reward jams to pop cultureFEATURES:• Easier topick up and control than Cookies Jam, and more addictive cookiegames game play• Controls via virtual analog stick or simple dragand swipe!• With 7 new color boom effects that becomes the only oneand very sparkling in the Cookies Jam games• Match 3 or more cookiein a line to crush them.• Match 4 cookie to create speciallightning item can make a blast to destroy all cookie crush jam ina row or column.• Match 5 cookie with T or L shape to createspecial Cookie Smash can destroy all cookies around it.• Classiccookie games, you can make thousands of not only sugar smash butalso sweet and confounding Gems here!• The color-changing CookiesJam puzzle can eliminate to any other colored in each level.•Fascinating graphics and beautiful spectacular boosters, splendidHD colorful graphics!• The timing Cookies Jam free can extend theplaying time.• Outstanding graphics and music, easy to play, hardto stop!• Let's recreate the cupcake and sugar smash matching 3sweep games around the world!• Unique and delicious cupcake andcandy set with cookie and sugar in each level gives you tons ofsweet challenge.• Many colorful explosions with type of the CookieSmash.• Over 10.000 magical levels with more tons and challenges incookie matching 3 for endless FUN! Await you enjoy the app! and wewill update more levels time by time• Totally free for all playersand fascinating graphics with special design Cooking jam.• Cookiesand sugar can be vertical, horizontal, diagonal and evenbackwards.• Obtain hint in several ways to solve difficult puzzlescookies and sugar• Hidden extra words are waiting to bediscovered!• Let us experience the sweet cookie delights and sugarsmash, whip your way to make delicious cake smash!• The bombCookies Jam can eliminate the gems game around with multi color formore fun.• Suitable for both kids and adults to train cookiedelights games and enhancing genies skill• Fortune Cookie Crushfree with surprising rewards!• QUEST contents in Cookies Jam•Visually pleasing to play Cooking Jam in various kinds! NO WIFI? NOPROBLEM!• You can play offline in anytime in the Cooking jamCookingJam - Match 3 Games for Cookie is a fascinating puzzle game forfree everyone, which is more addictive than Cookie Games, and youcan find endless interest from it.Welcome to the sweet fairytaleworld full of cookies and sugar in Cookies Jam 2018 ! Let themanuscript for the cookie and sugar, sweep the cupcake all over theworld !